Bold Tendencies is a non-profit summertime sculpture project dedicated to showcasing new art by international artists. Held on the top four floors of a disused multi-storey car park in Peckham, South London with spectacular views across the city. Bold Tendencies is committed to supporting the vision of artists and actively engaging audiences. Image: Martin Westwood, Pere and Terre Hanging Out at Bistro Repetere, 2012, mixed media with farfalle extrusions, dimensions variable. Photo: Damian Griffith. Courtesy the artist and Bold Tendencies. Troubling Space: The Summer Sessions is a project about space. We usually think of space as something that is just there, all around us, given. Socio-urban and architectural theory has argued that space is not self-evident, rather that it is socially produced; we produce the city, the digital landscape, office waiting rooms, the postal system, the nation and its territory by the way we live in and occupy it, use it, by what we wait for in it, send through it, and the violence we use to try to control it. Troubling Space includes works by eleven artists from the Zabludowicz Collection in addition to a new site-specific commission by London based artist Helene Kazan. Image: Troubling Space: The Summer Session, Zabludowicz Collection, London, 2012, installation view. Photo: Stephen White. Courtesy Zabludowicz Collection. 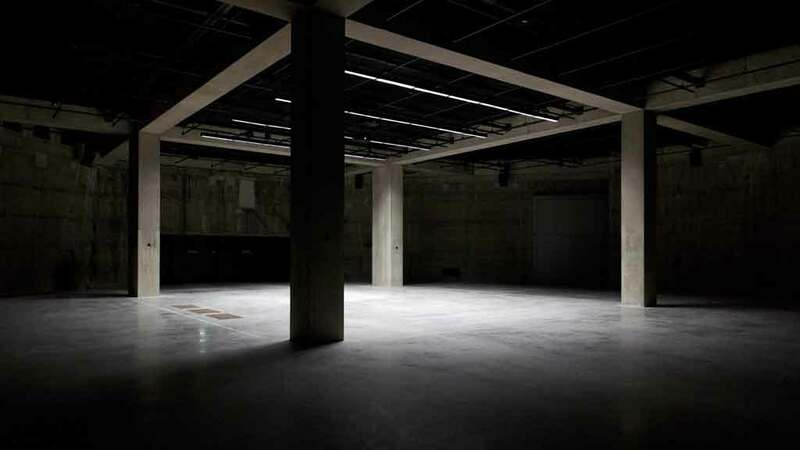 Be a part of Tate Modern’s new space. The Tanks are the world’s first museum galleries permanently dedicated to live art. For 15 weeks these magnificent raw, industrial spaces offer a sensational line-up including a commission by Korean artist Sung Hwan Kim and brand new works from Tate’s collection by Lis Rhodes and Suzanne Lacy. Experience live performances from over 40 of the world’s leading artists, learn more about live art through talks and symposia and drop in to Undercurrent festival for young people. 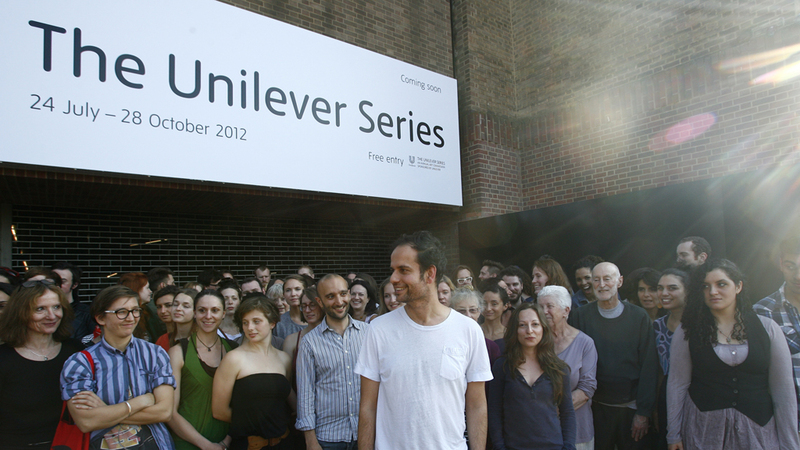 Image: Tino Sehgal and participants of These Associations outside Tate Modern. Courtesy of Johnny Green. A project by Suzanne Treister at Raven Row over four weekends featuring four keynote speeches within a specially designed theatre: a global futurist, a U.S. Security Agency insider, an anarcho-primitivist and the international expert on world’s fairs… Alongside an exhibition including three unique libraries, two video lounges and designs for a virtual world’s fair. 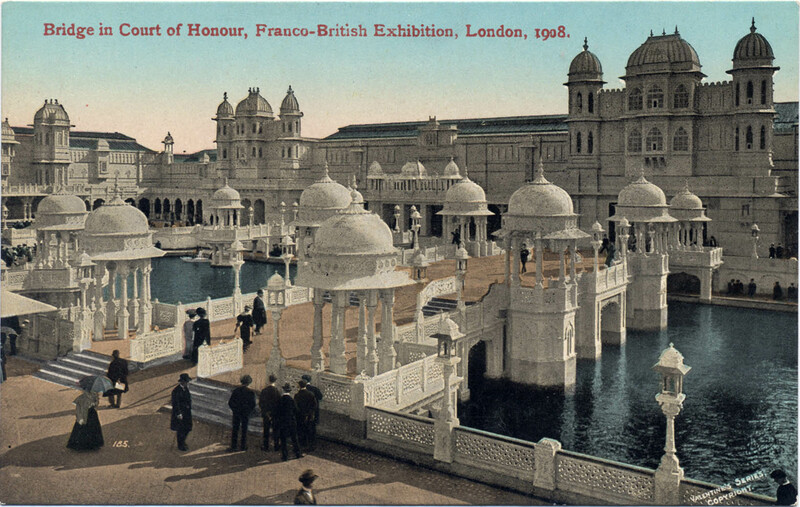 Since London’s Great Exhibition of 1851 world’s fairs have provided a space for nations to represent themselves. They are potent signs of the fantasies, politics and technologies of their times and aspirations for the future. THE REAL TRUTH A WORLD’S FAIR exposes aspects of the present and proposes ways into the future. Image: A WORLD’S FAIR postcards, Collection of Suzanne Treister. Courtesy the artist and Raven Row. Taking place as part of the London 2012 Festival programme and inspired by the spectacular rise of Brazil as an economic power and the preparations for the 2016 Olympics in Rio de Janeiro, this new exhibition invites you to examine your psyche and decide whether you are ready for a more Brazilian world. 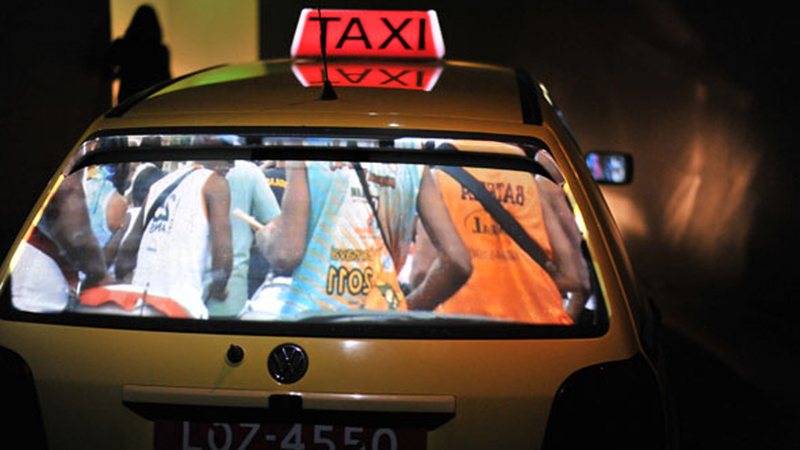 Embark on your journey through The Humble Market and experience the hustle and bustle of the Rio de Janeiro carnival from a Brazilian taxi, lie back on the grass and contemplate the universe and discover what happens when the impersonal automated voice on the telephone suddenly gets very personal indeed. Don’t miss this ambitious fusion of theatre, performance and media art from UK/Brazilian theatre network Zecora Ura and artists Jorge Lopes Ramos, Alastair Eilbeck, James Bailey and Persis Jade Maravala. 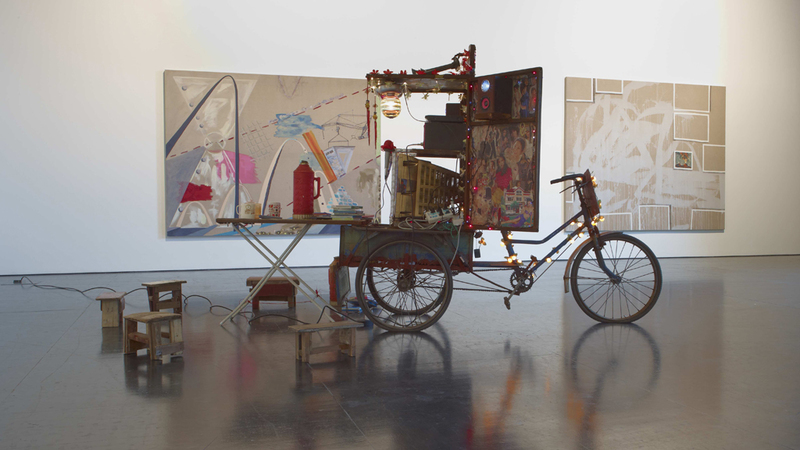 Image: Carnival Taxi, 2012, Zecora Ura, Jorge Lopes Ramos, Persis-Jade Maravala, Alastair Eilbeck and James Baile. Part of exhibition: The Humble Market: Trade Secrets. Installation view at FACT (Foundation for Art and Creative Technology). Photo: Brian Slater. Infinite Jest comprises three exciting international whose works are inspired by circular narration, infinity loops and möbius strips. This exhibition is an intricate braid of their work, the title of which has been taken from the complex and gargantuan novel, Infinite Jest, by David Foster Wallace. The three artists featured in the exhibition are Cinthia Marcelle who uses video, collage, painting and photography to document the effects of her interventions, which introduce coincidences and connections to everyday situations, Rob Pruitt, who is one of the USA’s best known contemporary artists and William Mackrel, a young artist equally fascinated by the sublime and the absurd. 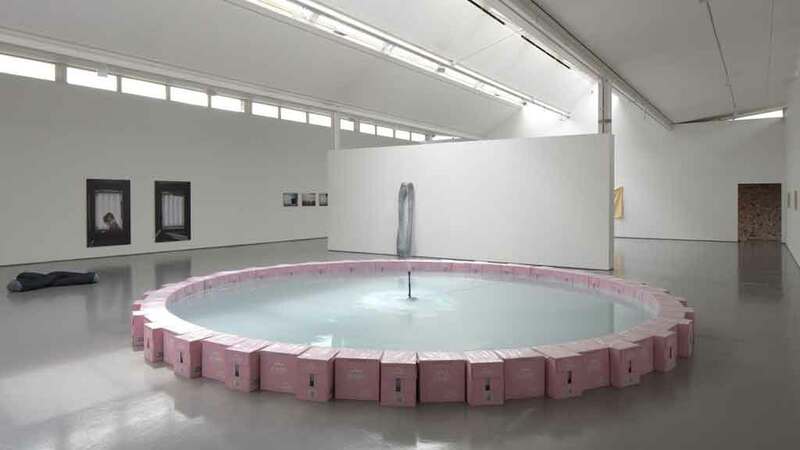 Image: Infinite Jest, Dundee Contemporary Arts, Installation view, 2012). Photograph: Ruth Clark. To coincide with the London 2012 Olympic Games, Film and Video Umbrella and De La Warr Pavilion present four newly commissioned moving image artworks on the theme of sporting excellence. Working in collaboration with top athletes and scientists, internationally acclaimed artists Dryden Goodwin, Susan pui san lok, Roderick Buchanan and Matthew Cornford and David Cross all consider the state of being ‘in the zone’ – the way in which athletes achieve a heightened sense of performance in which body and mind are operating in unison, at maximum impact and with optimum ‘flow’. The exhibition features sports from diving to athletics to hockey and shows the athletes at their maximum level while competing in their sport. Image: Dryden Goodwin, Poised, 2012. © the artist. Courtesy of Film and Video Umbrella. 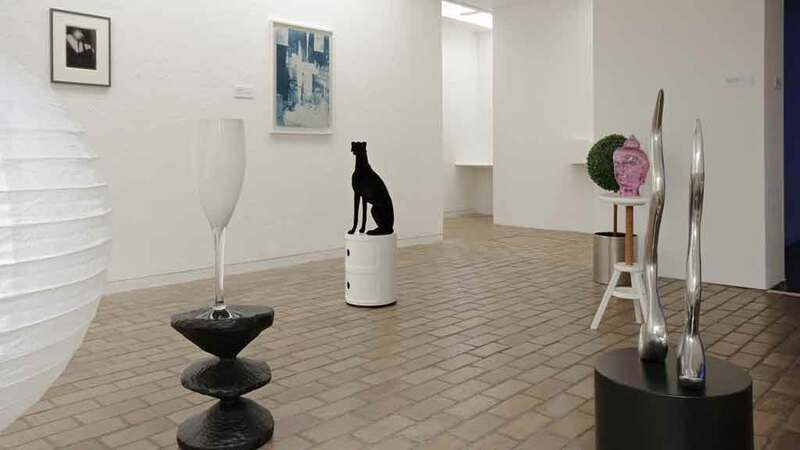 Introducing Kettle’s Yard’s Associate Artists, this display presents work by Matei Bejenaru, Matthew Darbyshire, Lorna Macintyre and Jeremy Millar alongside objects, artworks or archive materials they have selected from the Kettle’s Yard collection. We have commissioned these four artists to make new work in response to Kettle’s Yard. They will be sharing their ideas and processes, presenting their work onsite, offsite and online over the course of the coming year. Image : Associate artist display in the gallery, Matthew Darbyshire’s Untitled: Object Arrangements, mixed media in seven parts. Lorna Macintyre’s Photo Radieuse, 2012, cyanotype. Kettle’s Yard, University of Cambridge. Ikon presents Deepest Sympathy (2011), a digital animation by British video artist David Theobald. 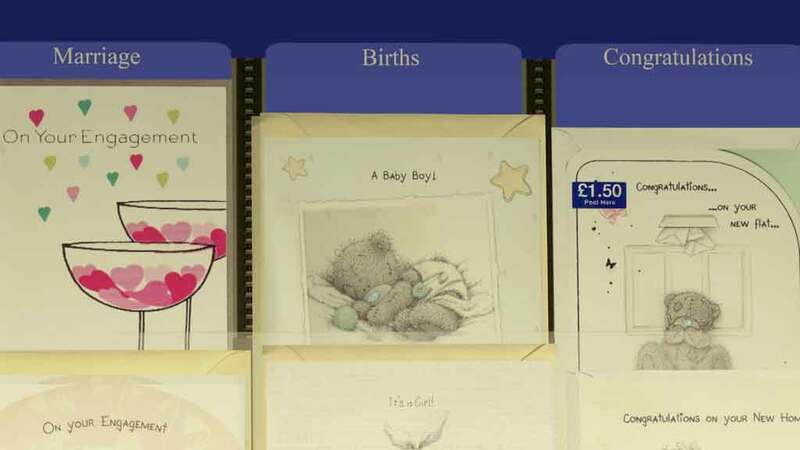 Through this short video, a biography is conveyed through the medium of greetings cards. Beginning at birth, they mark all of life’s loves, successes and tragedies: childhood birthdays, exam passes, career development, marriage, birth, divorce, retirement and death. In so doing, one person’s story is catered for as a set of pre-packaged events and standarised sentiments available for purchase. Image: David Theobald, Deepest Sympathy (2011).Video still. Courtesy the artist and Ikon gallery. Francis Upritchard’s psychedelically coloured human figures “live” on islands of ornate furniture. There is a festival feeling to their gatherings, emphasised by Upritchard’s acid-bright colours, hand-woven blankets and tie-dyed silks. Upritchard has said “all the things that hippies hoped would happen, or felt might happen, didn’t.” In one sense her exhibition is about the failure of the 1960s and 70s counter-culture that is still celebrated at festivals – and its gaudy, individualistic “alternative” aftermath. 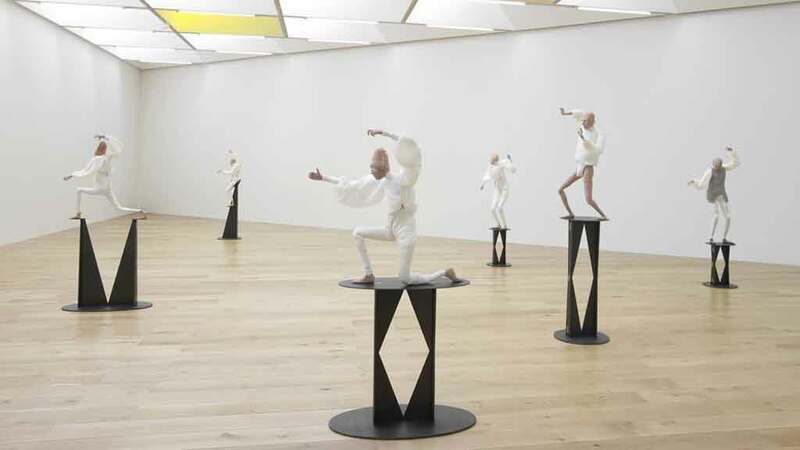 Image: Francis Upritchard, War Dancers (installation shot). Photo: Andy Keate.